Workers at Google just scored an impressive victory against US militarism. For months, Google employees have led a campaign demanding that the company terminate its contract with the Pentagon for Project Maven, a program that uses machine learning to improve targeting for drone strikes. Nearly five thousand Google workers signed an internal petition to cancel the project, and dozens resigned. Last Friday, the workers won. Google announced that it will not seek another contract for Project Maven, caving to employee pressure. The about-face is a big win against US militarism, and reflects the new political currents that have been developing within the tech industry since Donald Trump’s election. Ben Tarnoff recently spoke to one of the Google workers who helped lead the campaign (and, for the purposes of this interview, goes by the pseudonym Kim). They discussed how the campaign got started, how it grew, and what lessons it holds for future organizing in the tech industry. Can you explain the origins of the campaign? How did this get started? As soon as Google signed the Project Maven contract, there was internal dissent. It started around September 2017, and picked up speed in October. By January 2018, at least a dozen different teams knew about Project Maven. A group of Googlers from several different parts of the company — cloud, AI, communications, the Google Brain team, and DeepMind, among others — strongly objected to it. They got together and tried to raise their concerns through official channels and to Diane Greene, the head of Google Cloud. But the company’s human resources and ethics compliance teams dismissed those concerns. Within a couple months, it was clear the Googlers’ efforts weren’t going anywhere. The company was moving full steam ahead with the project. So they decided to take a different approach. They posted about Project Maven on the company’s internal social media platform, explaining the project and outlining their concerns. Their post got a ton of responses. The employee reaction was very strong against Project Maven. Diane Greene stepped in, trying to tamp down the concern by insisting that Project Maven was for strictly non-offensive purposes. But people weren’t persuaded, and many of them directly challenged Diane in their comments. Did the overwhelming response from other employees come as a surprise? Definitely. But after seeing that response, the Googlers who wrote the post felt empowered. They saw that they had a lot of internal support. So they helped assemble an open letter to Sundar Pichai, Google’s CEO, asking him to cancel the Project Maven contract, and shared it internally. It only got a hundred signatures that night. But the next day, it exploded. In less than twenty-four hours, it got a thousand signatures. That day, we had an all-hands meeting. There was a special announcement from Diane Greene, responding to employee criticism of Project Maven. She wasn’t prepared, and the response wasn’t assuring. That’s completely true, actually. Google has a more open internal culture than many other companies. There is an established tradition of critiquing company decisions. But his remark came across as tone deaf and out of touch to almost every Googler who heard it. Did the all-hands meeting mark a turning point in the campaign? It certainly helped. I think it showed that there was a lot of support to continue putting pressure on the company around this issue. After the meeting, there was a huge bump in signatures. Just that day, we got another five or six hundred signatures. The next day, there was another thousand. The letter spread like wildfire. The campaign began to take on a life of its own. People began organizing their own initiatives at offices all over the world, from Mountain View to Seattle to New York to Montreal to Dublin to Zurich. What did those initiatives look like? They took a lot of different forms. One group got together to start tracking the list of employees who had resigned because of their opposition to Project Maven. Another group tracked all of the media coverage of Project Maven, which was beginning to grow, largely driven by Kate Conger at Gizmodo. Another group got employees to submit questions about Project Maven to every single all-hands meeting, and then got other employees to up-vote those questions so they would be asked. There was also a group that documented the timeline of Project Maven, from the initial meetings between leadership and the Defense Department. There was a group that asked for personal statements about Project Maven from everyone who wanted to share one, and yet another that created a profile photo supporting the campaign that employees could use on the company’s internal social media. One group just made memes. There’s a popular internal meme generator at Google called Memegen. Every day, this group used Memegen to make memes about Project Maven and shared them widely. They were funny, dark, and often called out leadership directly. We know those memes made a big impact, because Google leadership starting using them as one of their metrics for measuring internal chatter about the project. Was there any coordination among these different initiatives? Or were they mostly developing autonomously? They were mostly autonomous, but there was a lot of ongoing conversation about tactics. There was also an announcement list for everyone who had signed the letter. On the list, updates would be shared from all of the different initiatives to encourage people to get involved with one of them. You also drew on support from outside of Google. Yes. 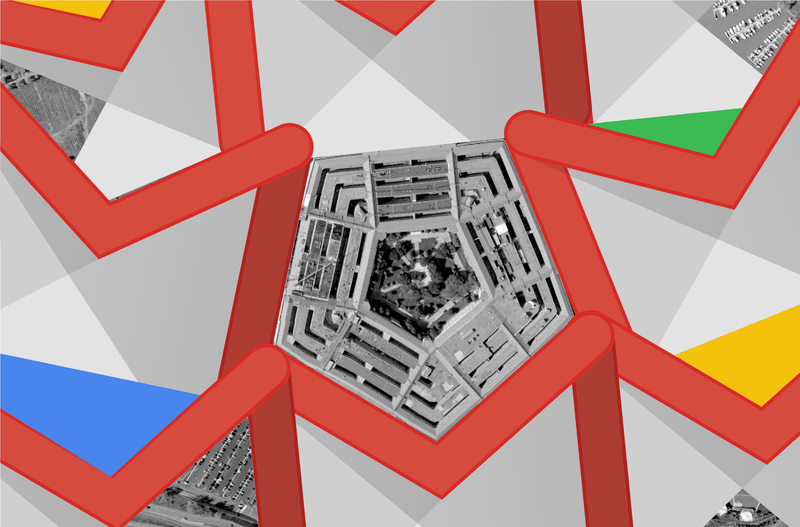 In April, the Tech Workers Coalition launched a petition on Coworker.org signed by workers at other tech companies like Amazon, IBM, and Microsoft calling for Google to cancel Project Maven and for the industry as a whole to refuse to work with the Pentagon. Then in May, the International Committee for Robot Arms Control (ICRAC) published an open letter written by academics Peter Asaro, Lilly Irani, and Lucy Suchman in support of our campaign against Project Maven. It was signed by a number of prominent scholars in AI and computer science, including Terry Winograd, who was Larry Page’s PhD adviser at Stanford. That had a massive effect. Those scholars gave us credibility. We had real experts sounding the alarm, saying, “Hey, this is actually a bit more like building the atomic bomb than building Gmail.” I know that letter put a ton of pressure on Fei-Fei Li, Google’s head of AI, who’s also a professor at Stanford and the director of their AI lab. How did leadership react as the pressure increased? Their main strategy was to hold more meetings. A couple weeks after that all-hands meeting, they decided to do something more drastic. They announced that they would be holding three two-hour meetings to discuss Project Maven — one each for the American, European, and Asian offices — that anyone in the company could join. That was huge. We’d never seen anything like that: an open invitation to every Googler to comment on a decision that was being made at the highest level. They started the meetings off by breaking us up into small groups. They said, “We want everyone’s opinion to be heard — even the unpopular ones.” It was clear from their tone that they knew their opinion was the unpopular one, but that they were hoping that some employees would carry their water for them. But it didn’t happen. It didn’t happen at all! People were very agitated. The second hour of the meeting was a Q&A where anyone could ask a question. And leadership just got hounded. How would leadership respond to that kind of criticism? They also tried to downplay the scope and involvement of the project. But that rhetoric dissolved when we found out that leadership had been lying. What were they lying about? From the beginning, they told us that Project Maven was a small contract purely for non-offensive purposes. They said that we weren’t building anything custom. They said that this was a one-off project only worth $9 million, and that it wasn’t part of any further collaboration with the Pentagon. Those all turned out to be lies. On April 12, DefenseOne published an article that landed like a bombshell in the company. Drawing on conversations with Pentagon officials, it revealed that Project Maven was actually a pilot project for future collaborations between Google and the military. In particular, Project Maven was part of Google’s push to win the Joint Enterprise Defense Infrastructure (JEDI) contract. JEDI is the military’s next-generation cloud that will network American forces all over the world and integrate them with AI. It’s basically Skynet. And all the big cloud providers want to win the contract because it’s worth $10 billion. When we found out that Project Maven was an audition for JEDI, people started becoming extremely concerned. And as the media attention to the story increased, we learned a lot more. For instance, Diane Greene had told us that the Project Maven contract was only for $9 million, but internally they expected it to increase to $250 million per year. And they weren’t just giving the Pentagon access to open-source software — they were going to build a massive surveillance system that gave military analysts real-time information on people, vehicles, and buildings in a Google Earth–style interface. Exposing all of those lies damaged leadership on this issue just as much as anything else that we did. That loss of trust really hurt them. Then at a company meeting on June 1, Diane Greene announced that Google would not seek another contract for Project Maven after the current one expires. Did that come as a surprise? It came as a huge surprise. Sometimes, with organizing, you don’t see how close you are to winning something until it happens. Some people were starting to get demoralized by that point. Our campaign had been going on for months, and it didn’t feel like we were making much progress. Then all of a sudden we got this huge concession. This is an historic achievement. But we’re not done: Project Maven could continue to operate until March 2019. If Google is not going to pursue any more contracts, then leadership should cancel the current one now. They should say it was a mistake. And they should thank their employees for pushing them to do the right thing. You said that the internal reaction against Project Maven was quite strong from the beginning. But Silicon Valley has a long history of working closely with the military — military funding is why Silicon Valley exists in the first place, after all. So why are tech workers standing up to the Pentagon now? Has something changed? After the Trump election, many tech workers became politicized. They were especially concerned that Trump would work with a tech company to build a “Muslim registry” — a database of all Muslims in the United States, which he had promised during his campaign. This led to the creation of the Never Again pledge in December 2016. Over three thousand tech workers signed it, pledging to refuse to build a database that identified people by race, religion, or national origin. The Project Maven campaign is the Never Again pledge in action. This is what it looks like when we actually try to say “no.” It’s messy. It takes a lot of actual organizing effort. You’re not going to get a project titled “Muslim database.” But if we organize collectively, we can put our resistance into action. As for the deep history between Silicon Valley and the Pentagon: a lot of people recognize that. But just because tech came out of the military doesn’t mean it has to be beholden to the military. We don’t have to keep using this technology to kill people just because that was the original impetus for developing it. Google also has a fairly international workforce. Did that play a role in the campaign? It was absolutely critical. Many of the Googlers who supported the campaign come from regions of the world where the American military has been extremely destructive. In May, the New York Times published an op-ed arguing that Google should continue Project Maven because it served American national security interests. Internally, that op-ed completely fell flat. Even people who didn’t support canceling the contract said the piece clearly didn’t understand that Google is an international company. The argument didn’t make any sense. How would you describe the political orientation of the campaign? Another New York Times article quoted a former Pentagon official saying that anti-Maven organizing within Google reflected a “strong libertarian ethos among tech folks.” Do you agree? Libertarianism is the ethos of the leaders of these big tech companies, not the rank and file. Our campaign had nothing to do with libertarianism. We stood up because we believe workers should have a voice. We stood up because we believe that companies should be accountable to their users, their workers, and their communities. And we stood up because we believe a strong ethical framework that values human life and safety is inseparable from positive technological progress. It sounds like the campaign exposed a stark division between the leadership and the rank and file; typically, tech companies are very adept at concealing that division. Before the campaign, a lot of Googlers had never considered the fact that their values might not be aligned with the values of leadership. Organizing around Project Maven helped people realize that no matter how good their job is — and generally speaking, Google jobs are good — they’re still workers, not owners. Most of us felt it was absolutely necessary to put the business on hold while we figured out what Project Maven was. Leadership, on the other hand, wanted to press forward regardless of ethical concerns, in a ruthless pursuit of profit. It became clear that employees need a voice if the tech industry is going to be held accountable. As you keep building out the internal organizing infrastructure that you and your coworkers created during this campaign, what are the possible forms that it could take? Where do you go from here? People feel their power now. At the beginning, individual Googlers were upset about Project Maven, but they felt powerless. They felt like they were out there on their own, yelling into the void. The success of the campaign shows that when we stick together, we get more done than when we go it alone. We have to keep building a voice for workers based on mutual trust and aid. We have to continue building relationships not just at Google but across the industry and with other groups as well, like ICRAC, Tech Workers Coalition, and Coworker.org. We also need to reach out to the users of our technologies and build bonds of mutual interest with them. And, even though this was never on the table for the Project Maven campaign, some Googlers are even talking about unionization. If we want to take collective action, we need to be organized. Especially if we want to explore other, riskier tactics such as protests or strikes. Some observers find it hard to understand why tech workers would want to unionize, especially those who work at elite firms like Google, where the pay and benefits are excellent. What could their grievances possibly be? A union is just workers coming together to get more done collectively than they can by themselves. If you’ve ever organized even a little bit, you know that every workplace has grievances. That’s because the structure of every workplace is the same. Workers have no say. They have no voice. If they disagree with management, then they’re out. That’s not to equate the level of exploitation. Workers in a minimum-wage service job are far more exploited than those working for a top tech company. But the structure of the workplace is the same. In any workplace, if you start talking to people, you find grievances. And where there are grievances, there’s agitation. Within Google, it sounds like one grievance is the desire among workers to have a say over what kind of technology the company builds. Definitely. Tech workers want a say over the work that we do, because our work has the potential to affect a lot of people. There has been growing public awareness about the dark side of technology recently. We’ve seen a lot of reporting and commentary on things like algorithmic bias, predictive policing, and facial recognition. Those stories played a big part in our campaign. As tech workers, we are acutely aware that the technologies we build often perpetuate oppression. Ultimately, the Project Maven campaign wasn’t just about whether Google should build this one tool for the military. It was about using our power as workers to ensure that technology is built for social benefit and not just for profit. How could a tech workers’ union help advance that goal? Technology is something that humans build. As a result, it reflects human decisions. But if tech workers don’t get organized, we won’t have the power to participate in those decisions. They’ll be made by management — and the only thing that management cares about is making money. One response we heard a lot during the Project Maven campaign was, “If we don’t build it, someone else will.” But when tech workers stand up at one company and refuse to build something, it empowers workers at other companies to stand up and do the same. When we show our power in one workplace, it helps other workers show their power in another. By getting organized, we can also more effectively stand in solidarity with the service workers in our companies — the security guards, cafeteria workers, and shuttle drivers who often endure low wages and obscene working conditions. We need to get organized so that all of the workers who create the tech industry’s wealth can share in its prosperity. But we can’t get anywhere if we can’t get organized. Look at the teachers in West Virginia. Look at the power they built and the leadership they are showing. What we do and don’t do matters. Tech workers have no excuse. It’s time for us to join the new labor movement. Kim is a Google employee. Ben Tarnoff is a founding editor of Logic . Elon Musk Saves the World?